The Rope climb is one of the oldest, and perhaps most natural exercises known to man, next to picking something up and putting it down. I’m sure cavemen even once used rope climbs (or a vine of sorts) to either escape danger or scale in search of food. It was even an Olympic event at one time. The resurgence of functional fitness has seen an explosion of fitness enthusiasts once again inch worming their way towards fluorescent lights and dusty rafters. The misconception about climbing a rope is that it requires a tremendous amount of upper body strength. This is only possible if you know how to use any one of the 3 foot lock techniques known as S wrap, J wrap front and J wrap rear. Or as I like to refer to the J wraps as secure J wrap and fast J wrap. Each one uses a different method to secure your feet to the rope and allow you to push down with your legs to ascend rather than pulling yourself up with your arms. The S wrap is considered one of the more secure foot locks as it utilizes the most amount of contact to create friction between rope and body. In this method the climber would wrap their leg around the rope a full 360 degrees so that the rope is cork screwed around the climber’s lower leg and draped over the shoelaces of the base leg. The climber would then step the free foot on top of the base foot clamping the rope between the feet. This method is extremely secure but also probably the slowest method because the climber has to somewhat shake the rope loose then re-wrap it around the leg on each ascent. The increased friction also promotes the slowest descents as well. This is also the technique that injures the climber’s legs the most from rope abrasion. The fast J wrap method utilizes the least amount of rope to body contact and mostly relies on rope leverage by guiding the rope down the outside of the climber’s leg and under the foot where it is pinched between both feet. This method utilizes the bend in the rope to create a J shape and somewhat of a stirrup that the foot rests on while the other foot provides a side clamp to hold the rope in place. This method uses the least amount of friction and therefore is probably the fastest of the 3 techniques but also the one that wears out the climber’s grip strength the most. To descend the climber simply has to separate the feet allowing the rope to freely slide between the shoes. The climber must be careful not to separate the feet too much, which can result in a sudden free fall causing injury upon impact with the ground. The 3rd technique is the secure J wrap, which I call the Goldie Locks of the 3 options because it is both secure and fast by using just the right combination of friction and increased leverage to create a secure but fast foot lock. In this method the climber would wrap their base leg only ¾ of the way around the rope so that the rope feeds down between the legs and wraps behind the calf of the base leg and stops on the outside of the foot. The climber then feeds the rope up beneath the base foot with the other foot and pinches the feet together clamping the rope in place. Here the climber has effectively used a partial S wrap to enter the rope and finished with the J wrap under the foot to secure it. This method, when practiced effectively, is much faster than the S wrap technique due to less body contact and is less taxing on the climber’s grip than the fast J wrap because of the increased leverage in the rope. Descents are also quick and controlled by simply keeping the heels of both feet together and turning the toes away from each other to reduce the clamp tension. The corresponding video will show the 3 foot lock techniques as well as some drills and progressions to build up your rope climb skills. My suggestion is to try all 3 and figure out which one feels most comfortable to you. I can’t stress enough how important it is to feel confident in a secure foot lock when dangling 15 to 20 feet in the air with a fatigued grip. It is common to begin with the S wrap technique to build confidence on the rope then transition to one of the J wrap techniques to get faster on ascents and descents. 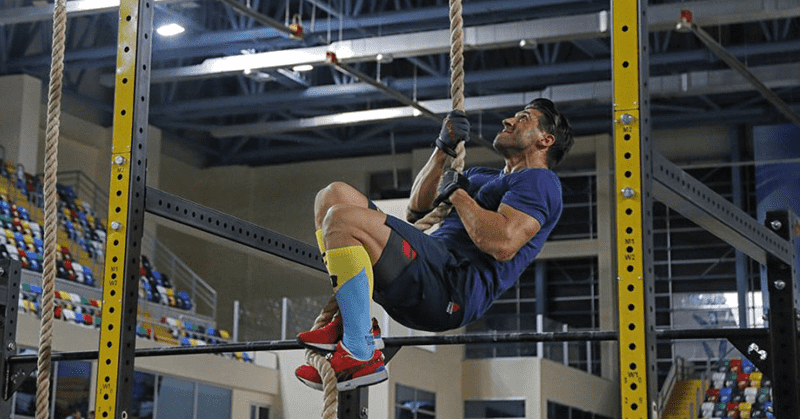 One last suggestion to ensure that you are using more legs than arms on rope climbs is to look down at your feet after each re-wrap to remind you to stand up on the rope rather than pulling your body up the rope with your arms. Often time spent looking up at your hands puts more emphasis there, leaving the feet out of sight and out of mind. Happy climbing and use your feet so you’re not just a dope on a rope!